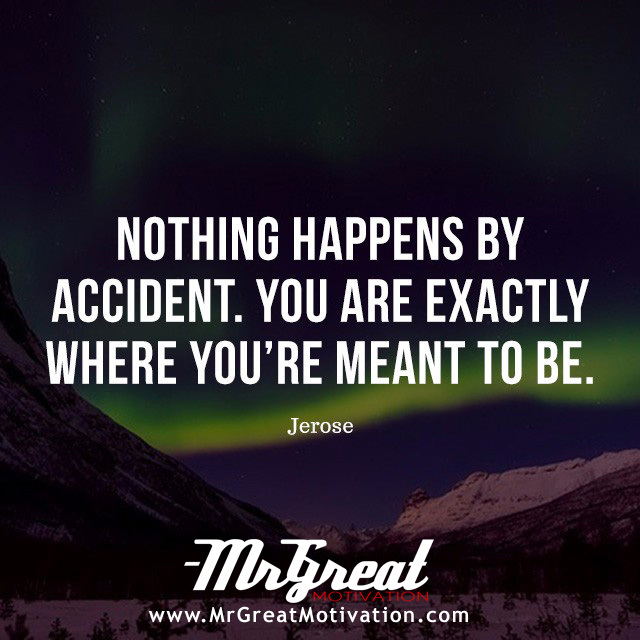 Nothing Happens By Accident. You are Exactly Where You're Meant to Be. People use many excuses for not acquiring more responsibility in life, claiming that they are accidents who came into the world by mistake and aren’t even supposed to be here! This is not true. Everything does happen for a reason. When you got that new job you were hoping for, that happened for a reason — you applied for it, you interviewed well, and the company thought you were the best candidate for the job. It was your effort and hard work and you fulfilled the requirements as well as qualification for the job. When you failed the test or interview that too happened for a reason — you spent too much time on social media and going out with friends and catching up on your favorite movies and sports when you should have been studying. Our tenacious courage should compel us to try harder. Our perspective shall be worked well until our hard work outnumbered our victories. There is no such thing as coincidence and it’s all part of the great plan. This is the best of all possible worlds. Each form betrays the same enormous conceit and the same willful negligence.